Today is Tuesday, April 15, 2014. With this post, I will have published 365 consecutive daily entries in this blog, the fulfillment of my goal. Some of my readers are aware that I have also been working on another blog, and that I succeeded in blogging for a whole year on that one, too. If you are interested in reading that blog, it can be found here. When I began this blog, I said that I wanted to achieve clarity in my life. I have certainly had a lot of opportunity to think about what is truly important to me, and what I’d like to achieve at this stage of my life. I now have a much more concrete plan for the next few years. 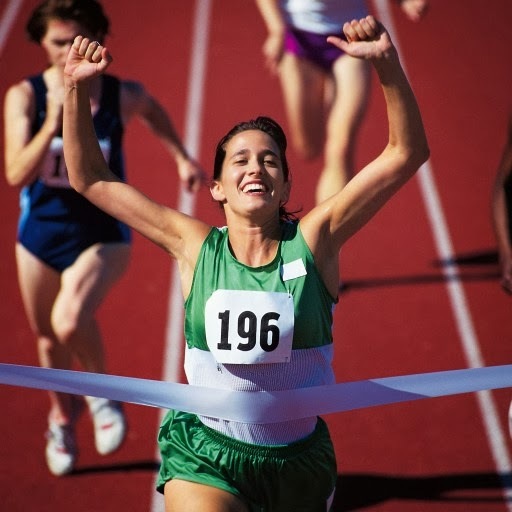 It remains to be seen whether I will accomplish all of the goals I have set for myself within the last few months, but perhaps it isn’t the actual accomplishment that is important. Maybe it’s just working toward the goals that is important. I have enjoyed daily blogging, and found it to be a very good discipline for me. I plan to continue to add posts to this blog from time to time, but I need to step down and turn my attention to other things. I will be traveling a bit for the rest of the month of April, so will most likely resume posts in May on a much less hectic schedule. I’d like to thank all the readers who have followed me this year, and those who have shared various of my blog posts. I hope that the things I have written have made you think or wonder. I hope that some of them gave you encouragement or validation. I hope one or two of them challenged you a bit. Today is Monday, April 14, 2014. When I was young, success for men was defined as having a great job that paid well, and finding a trophy wife who was not only beautiful, but smart and someone who could keep house and raise kids, besides being eye-candy at social events. Evidence of success for men included a fine home and a sleek, powerful car, maybe some tech gadgets, and perhaps a golf club membership. For women, success included a well-kept house, well-behaved children, and a generally well-ordered life. The woman was supposed to attract a mate who made enough money to provide her with the finer things in life. A little later on in my life, success for women was expanded to include a satisfying career for women, at least until she got married, and then maybe just interrupted for a short time for child-raising. Very few, if any, people ever talked about trying to find their “purpose” in life. A blogger asked some of his subscribers to define success recently, and one of his readers came up with a really succinct, precise definition. A couple of weeks ago I finally got hold of a copy of The Afterlife of Billy Fingers, by Annie Kagan. The book tells about Kagan’s communication with her brother shortly after his death due to alcohol and drug abuse. 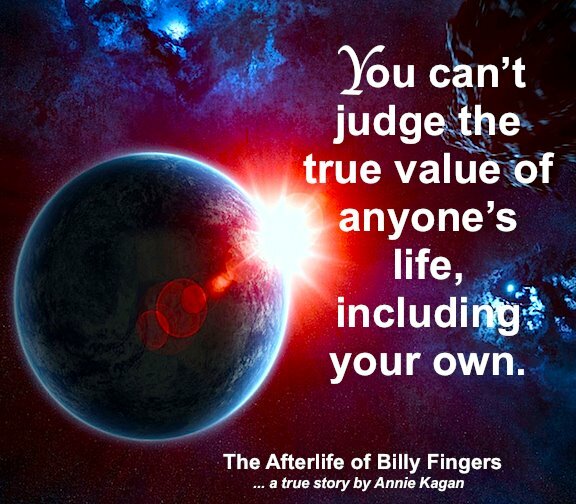 Billy Fingers tells his sister Annie that the purpose of his life was to have some harsh experiences that would burn off a bunch of karma and make him more sensitive to other people. A lot of times when people talk about their “purpose” in life, they think in terms of helping others or leaving the world a better place, but spiritually speaking, our purpose is often a lot more like Billy Fingers’ purpose – to have certain kinds of experiences that will end up making us better co-workers with God. “You can’t judge the true value of anyone’s life, including your own,” said Billy Fingers to his sister. The carrot illustration above is a good way to visualize Billy’s advice. Billy Fingers’ life didn’t look at all good. In fact, it looked downright degenerate. Billy was a drinker who did drugs and dealt with shady elements. At the end of his life (and he died quite young), he was having health problems directly due to his abuse of drugs and alcohol. Few people, looking at Billy’s life at the surface level, would have guessed that his life was fulfilling some sort of divine plan. Nobody would have termed his life successful. 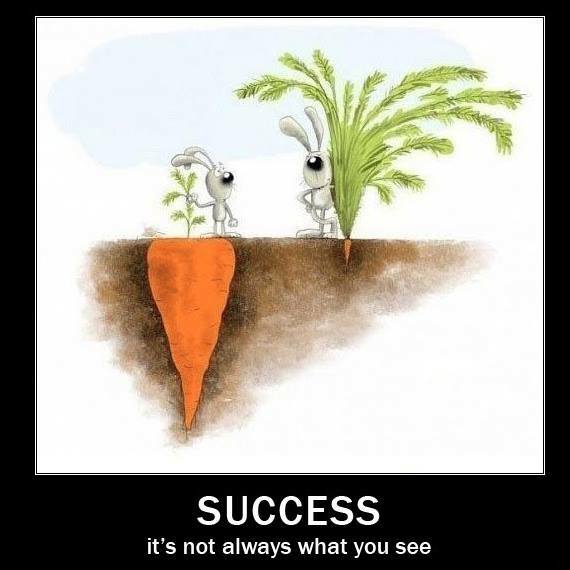 If you and I had looked at his life, we would have judged it just like the carrot on the left side of the drawing, the one with skimpy leaves above ground, unaware of the huge carrot growing beneath the soil. If Billy had been aware of his “purpose” in life, would he have accepted it? Would he have fought against it? It’s hard to say. But it occurred to me that in his particular case, knowing his Soul purpose might not have been the best thing. I’ve always thought it was important to know our Soul purpose, but now I’m thinking that this may not work for everyone. Today is Sunday, April 13, 2014. Maybe that’s why most of us experience such disappointment over love in our lives. We’ve defined it wrongly, and so we expect things to happen that don’t happen. And we always seem surprised about what does happen. If we realized that love isn’t supposed to be some kind of joyride all the time, but rather a struggle, our expectations might be more in line with reality. We don’t love someone because they’re perfect. They may seem perfect, at first, but they’re not, and we eventually find that out. Then, the challenge is to continue to love them, warts and all. This is just as true of our children and our parents as it is of our friends and significant others. It can be painful to watch them get hurt and make mistakes. It can be frustrating when they are stubborn and contentious. It can be downright embarrassing, sometimes, when they do and say foolish things. It can be heartbreaking when they fail and suffer. The key is not to try to change the other person, but to try to change ourselves. As we go through life, we learn the qualities necessary to love others: patience, perseverance, humility, grace, loyalty, trustworthiness, reliability, honesty, kindness, open mind, open heart, discipline, forgiveness, responsibility, even temper, courage, attentiveness, optimism, balance, and appreciation. Our interactions with our loved ones give us ample opportunity throughout our lives to cultivate these very important qualities in ourselves. Most of the time, we fail to notice how our loved ones have changed us. We wait until a person dies or moves away to realize what a big impact they have had on us, how they changed our lives. A really good exercise in cultivating gratitude is to carve out a few moments from our busy schedules every so often on a regular basis, just to appreciate the positive ways that our loved ones have affected us. Today is Saturday, April 12, 2014. A company in the U.K. has invented something called the SarcMark to use after sarcastic statements in emails, because it is often difficult to tell whether someone is being sarcastic in writing. As many of you know, flame wars have erupted over this issue. The other day I was writing some lesson plans for a fifth-grade reading class and I contrasted sarcasm with irony. Both sarcasm and irony involve saying or writing the opposite of what you really mean. Irony is generally used to make a remark humorous, while sarcasm is used to insult or make negative comments. As a teacher of English as a Second Language, I realized very early on that people who did not speak English as a native language often missed sarcastic or ironic remarks, and I learned to say, “I’m teasing” whenever there was danger of a misunderstanding. I taught my students to ask, “Are you teasing?” if they weren’t sure, and I now a few of them used that advice to good effect. Now that a lot of my communications are via email, social media, or instant messenger, I have learned to use cues that my meaning is ironic. Before the invention of emoticons (smiley faces) I could write <wink> or <grin> after a statement to show that my intent was humor. 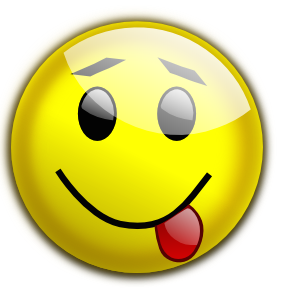 The little emoticon with the tongue hanging out has been used to good effect in emails and messages. If you use the text for the smiley face 🙂 you can simply substitute a letter P for the parenthesis. 😛 Whether or not the code turns into a little icon or not is irrelevant, as everyone who uses the Internet these days knows what the code means. Remembering to be proactive about announcing my humorous intent has saved me a number of times from getting into an argument. I think its common courtesy to use these aides in written communications, to make one’s intent perfectly clear, particularly since our communications nowadays through the Internet often involve those who are not of our own culture. Some cultures seem to tolerate sarcasm better than others. I’ve heard people from the U.K lambasting Americans for not understanding basic sarcastic humor. Truly, it is not that we don’t understand English. It’s that we don’t understand your culture. And some of us are not that thrilled about the use of sarcasm, anyway. Irony, OK. Sarcasm, not so much. The prevalence of sarcastic remarks in the U.K. has apparently made it necessary to invent a punctuation mark to use after sarcastic remarks in the same way that we use exclamation points after exclamations. If you go to the company’s website (Google SarcMark – I refuse to do their advertising for them.) you will see that you can download the software to make this punctuation mark for both PCs running Windows, Macs, and Blackberry. For now, the download is free. If it catches on, I suppose the company will begin to charge for it. Today is Friday, April 11, 2014. We’re all on a journey back to the Heart of God. I don’t believe that we will disappear into God and lose our individuality that we’ve worked so long and so hard to create. Rather, we will have a big, fat reunion with all the other Souls with whom we have had experiences along the way. By that time, we will have learned how to cooperate, and we will all be on the same page, working in unison right along with God. Nobody will care about taking credit for what is accomplished, and yet we will all be aware that our part is important, and we will play our part with joy. Meanwhile, back on earth, here we are, just trying to survive. We are walking that long and winding road, and it’s tough. It’s hard to imagine that we are really making any progress, because the road switches back so many times that we look around and see the same scenery, sometimes from only a slightly higher elevation. The road widens and narrows, and we are sometimes obliged to crawl along, or sidestep very carefully, so as not to fall off the road. Sometimes we go through tunnels that are so long we imagine that we will never see daylight again. Other times we are in full sunlight, and wish we could find some shade. When we do find shade, we wish we had the sunlight again. Most of the time, the road seems to be uphill, and there are rocks, a lot of rocks on the road, sometimes boulders that we have to move around or climb over. As with any road you are on, there are any number of “destinations,” along the way, and we sometimes imagine that we are at the final destination, only to realize that we were only making a small pit stop, and that we are expected to move on. We hit the road again, feeling badly that we have wasted time, but we realize at some point that we learn just as much at the rest stops as we do along the road. 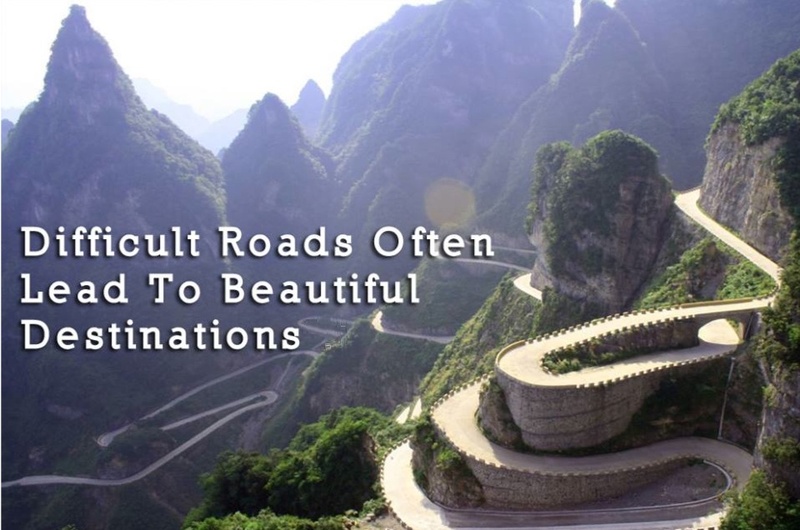 When the road is wider and nicely paved, we sometimes wish for a more exciting road to travel. When danger presents itself, we long for the easy path that bored us to tears earlier. Some of us try to take shortcuts that end up taking longer than we thought. Sometimes we decide to strike out on our own and blaze a new trail, never before trod by any other. It’s exciting, but dangerous, and there is always the threat of getting incredibly lost. Some of us take a road that looks promising, only to discover that it’s a sidetrack road that doesn’t lead anywhere, so we have to backtrack to the main road. Some people like to help make the road easier for others. They put up signs and hand out maps that point the way. Sometimes these signs and maps are accurate, and sometimes they are not. We realize that no matter how good the map is, we are still obliged to square the map against reality for ourselves. At certain points, we come to a clearing where we can enjoy a wider view and thus appreciate just how far we’ve come. We can’t stay there for long, either, but we can at least take heart from knowing that we have definitely made some progress. Later on, the road gets more and more narrow, and less and less nicely paved. Fewer people accompany us, and there are no longer any maps made by others to guide us. We have to depend more on our own natural homing instincts and our connection with the Source of All Life to find our way. Today is Thursday, April 10, 2014. Don’t think to much about the answer. Just decide yes or no for a moment. You can change your mind later. If you said no, get out a piece of paper right now and list the reasons why you are not happy. If you said yes, get out a piece of paper and list the reasons why you are happy. For most people, whether you are listing reasons why you are happy or unhappy, your list will feature a lot of things – things you have a lot of or things you lack. 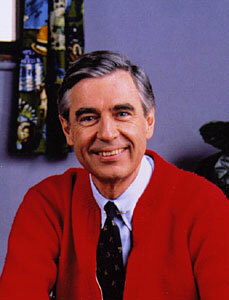 It may also feature people – people who do things that you like or people who do things you hate. Or maybe it will just feature some people who are around and available in your life or people who are no longer in your life. It may feature relationships – either relationships that are going well at the moment, or relationships that are full of problems. Your list might include some situations you are in now, such as a job situation, a family situation, a relationship situation, or a situation with friends. If you look at your list, whether it is a list of positive things that make you happy, or negative things that make you unhappy, it is still a list of things that are outside of you, as if the only way you can be happy is in response to something external. Either way, that’s not the case. If you’re happy, all those things that you listed are not what is really making you happy. What’s happening is that you’re deciding that there’s no need to fight against what is going on right now in your life. You’ve come to a point where you’re at peace. Things are in balance in your life. The energy is flowing and not blocked, and you are surrendering to the experience. But as soon as one of those things changes, you will be out of luck. You’ll be unhappy again. You will be a victim of circumstances. You will be able to maintain your happiness only as long as everything is going right. Of course, if you think you can maintain your happiness even when things start to go wrong, congratulations and more power to you. If you’re unhappy right now, all those things you listed are just rationalizations. What’s happening is you are deciding to fight against what is going on in your life. You’re miserable because you have decided that things should be different, and you are feeling powerless to make any changes. You’re really no better off than the person who said he or she was happy, because you, too, are a victim of circumstances. Once you realize, however, that happiness is not an automatic response to external stimuli, you can throw away your list. 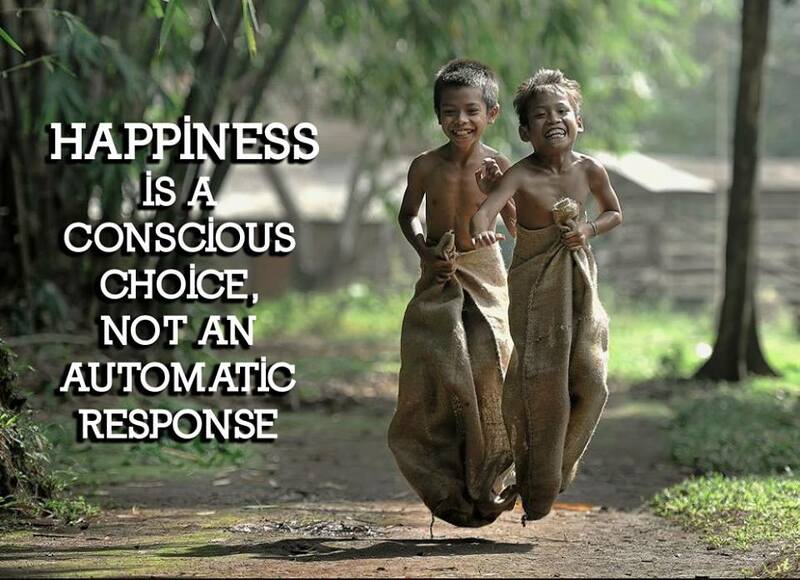 If happiness is a conscious choice, why are you not choosing to be happy? Oops…. ooooops…. don’t start whining about the things, the people, or the situation you are in. Your happiness is not tied to them, remember? But how, you ask, can I be happy when things are going wrong? How, indeed! Maybe this is a good time to figure out what happiness is. Sure, it’s a conscious choice, but what does it look like, sound like and feel like? How does it manifest in our lives? 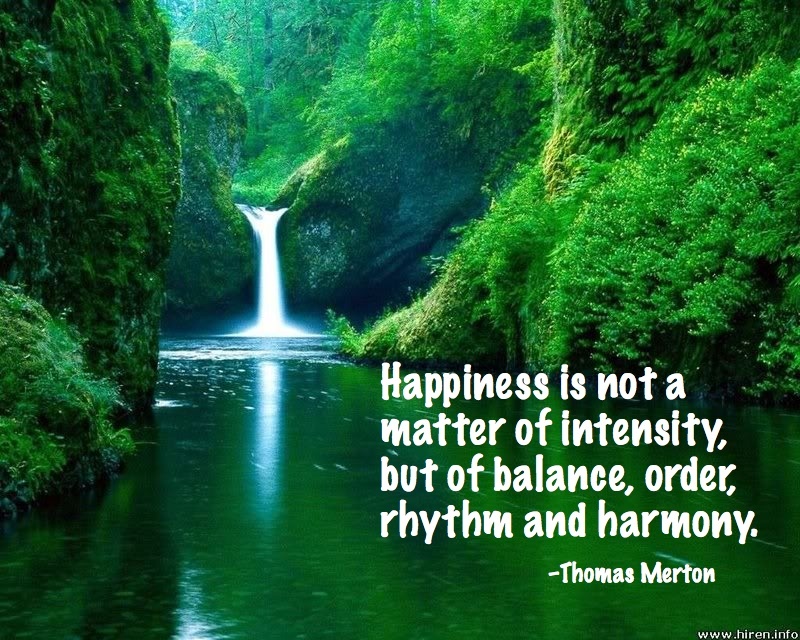 Happiness is not a matter of intensity, but of balance, order, rhythm and harmony. Thomas Merton gives us one answer. It’s not a matter of intensity. In other words, in order to be happy, we don’t always have to go around feeling bliss and joy. Maybe all we really need is a feeling of contentment. Let’s look at these terms. If you can maintain your emotional balance, even when things go wrong, you are miles ahead. When we are unbalanced, that’s when we say and do things that we regret later. It’s one thing to experience a moment of anger. It’s quite another to maintain that anger indefinitely. Balance is not something that you can achieve by accident. It’s a choice. Think about physical balance for a moment. To achieve it, you sometimes have to move in a more-or-less zig-zag pattern, and you also have to keep moving forward. In other words, balance is not achieved by standing still, but by progressing forward and staying focused on a target and making a constant series of small course corrections. Most people have some kind of routine that they like to follow, which may vary slightly on weekends, holidays, or vacations. Your routine helps you remember what is important in life, and it contributes to your feeling of safety and security. Think about the times you have felt the most unhappy. I’ll bet they were times when the normal order of your life was disrupted in some way. These are the situations that call for flexibility. More and more often, these days, instead of getting back to our nice, comfortable “normal” routine, we are obliged to establish a “new normal.” Most of us have some aspects of our daily routine that seem out of our control. For example, we have jobs where we must be at work by a certain time and finish by a certain time. We have project deadlines. Or our schedules are dictated by the needs of our children. It’s important to remember that we are the ones who agreed, on some level, to be put into these situations. Very few of us, however, lead totally regimented lives. There is always at least one element that is under our control. The trick is to find that element and impose your own order. When you are in rhythm, you are moving in sync, usually to a musical beat. When you are in rhythm with others, you are moving to the same beat others are. When we are working in cooperation with others toward some goal, we tend to feel a sense of belonging and accomplishment, both of which bring us a sense of happiness. The trick is that we must create this situation ourselves. I once went canoeing with a group of people. One couple had brought their teenage son with them. The young man, named John, was incredibly bright, but a little uncoordinated, and he was unfortunately prone to daydreaming, often tuning out the adults around him and immersing himself instead in his teenage fantasies. John was given an oar and expected to help the rest of us row the boat. Everyone’s oar was working in sync except John’s. “John, watch what you’re doing! Pay attention to everybody else’s oar. Make your oar do the same,” said one of the men. It took John a while to learn to anticipate everybody else’s actions and do the same. Of course, that meant that his usual pastime, daydreaming, was not going to be very useful. Rhythm demands that we focus outside of ourselves and look at the world around us. What is happening? How are things moving? How can we move in sync with other people, with situations, with events? When we move in sync with others, we avoid creating obstacles for others – and for ourselves. Rhythm and harmony are very similar. Rhythm seems to have more to do with timing. We sync our actions with others in time so that we don’t lag behind or rush ahead. When you are singing in rhythm, you are singing a note when others are singing a note, and you are holding the note for the same length of time. 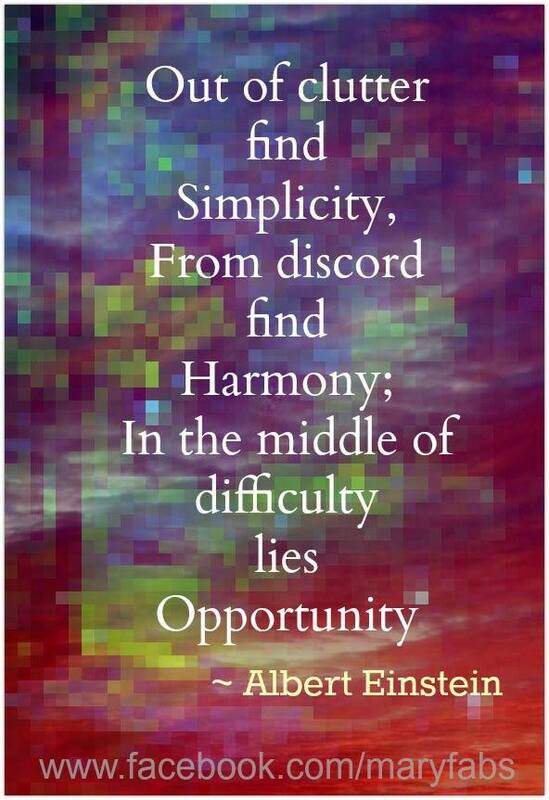 Harmony seems to be more about doing something different, but complementary. When you are singing in harmony, you are singing a different note, one whose vibratory rate is complementary to the notes of others. You are adding value to the note. You are working in cooperation with others. Harmony is cooperation. It’s seeing what needs to happen in order for a common goal to be realized. It’s knowing that what we are doing is an important part of the big picture. One final piece of the puzzle. 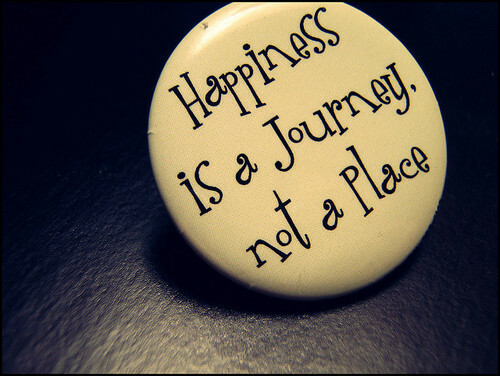 Happiness is not a place or destination, not a place that you arrive at and stay there. It’s a journey, an action, It is dynamic, not static. Today is Wednesday, April 9, 2014. Apparently, these are not so much Einstein’s words, as they are the three principles on which he based all of his work. They are admirable principles, and I think they could be put into practice by anyone, no matter what their IQ. I figure that if a German guy with bad hair can do it, surely I can. OK, so how am I going to make this happen? There are a lot of ways I can do this, but I need to start where I am now, and apply the principle to more things later. The clutter in my life right now is material – even though I threw scores of bags and boxes of things away, gave away more boxes full of things, and even sold a few things soon after I retired. I still have more to get rid of. That will be my first task. At some point, I would like to move to a more hospitable climate, and in order to do that, I will have to pare down my “stuff” a great deal, especially the books and clothing. Actually, I have done a pretty good job of this. I no longer watch TV – I don’t even own one anymore – and I generally only allow books into my life that will promote harmony. I am striving for harmony in relationships, and again, I’m doing pretty well. However, if I ever enter into another relationship with a significant other, this will become more of a daily challenge. Meanwhile, one way that I am combating “discord” right now is in my physical health. Illness is disharmony and health is harmony in the body. This is something I can address right now in three areas: diet, exercise, and amount of sleep. Right now as a retiree, my greatest difficulty is establishing and maintaining a sensible schedule of activities. It seems that when I make commitments, they tend to involve a lot of activity all at one time. This is an opportunity to cultivate more discipline, organization, and commitment.